The best steak marinade for Poor Boy Steak. We have a new video to go with this favorite recipe! I’m so excited to share this recipe with you, this family favorite recipe has won a bunch of awards. 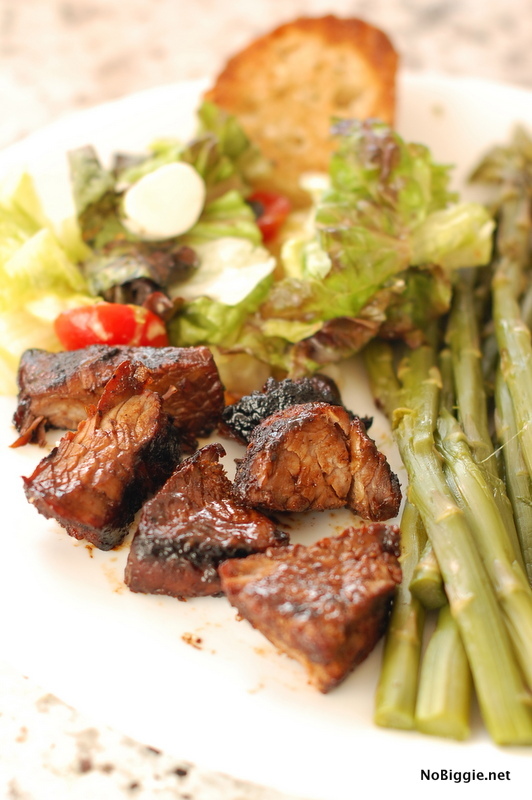 This recipe is for meat lovers / steak lovers: the best Poor Boy Steak marinade. You have to see this old newspaper clipping of my cute mom when she was a sophomore in High School. 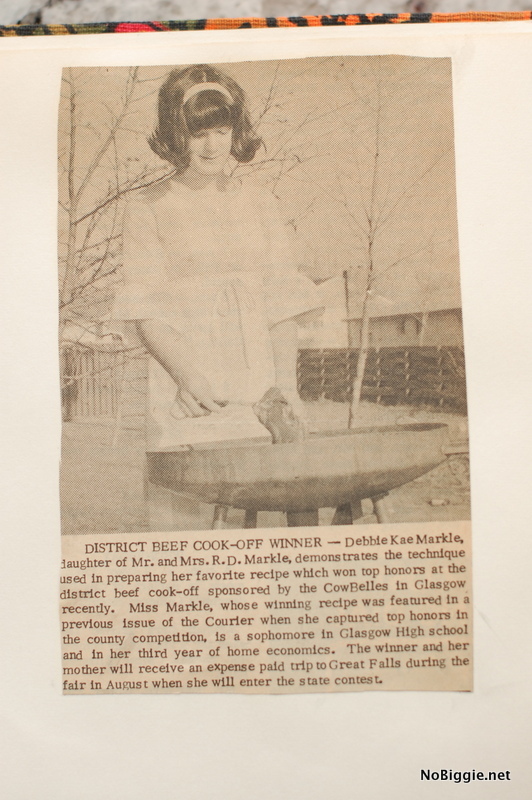 She took this recipe to the County Beef Cook-Off and won! I’m so proud! I can’t not giggle a bit when I see this cute picture of her…oh the hair! This one reads: “She’s in her third year of Home Economics.” So awesome! Why oh why didn’t I take Home Ec when I was in High School?! Three years of Home Ec?! My future self wants to travel back in time and make that happen…it could only have helped what I’m doing now, right?! 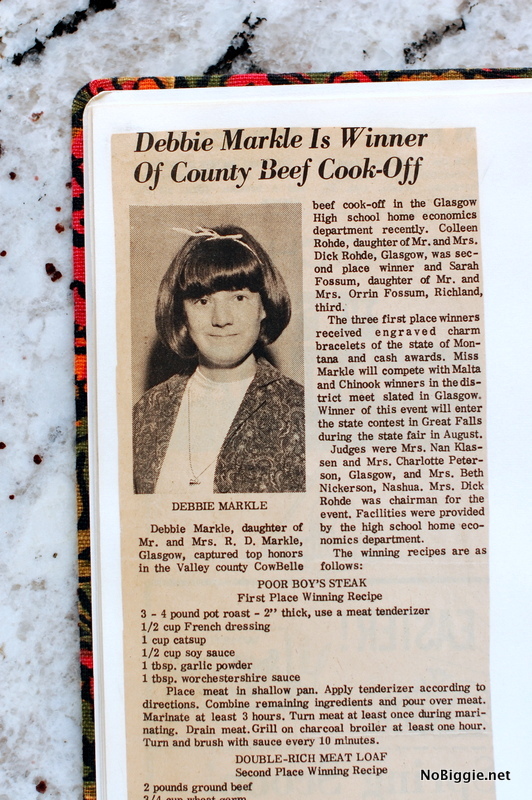 So when I claim “award winning recipe” …it truly was! Once you give it a try you’ll see why it’s so good. 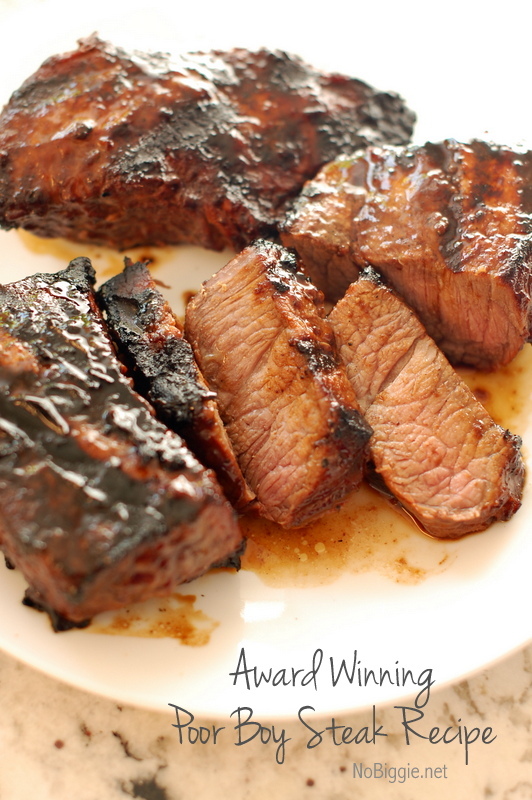 Here’s what the steak looks like with the marinade before you grill it. *Update – the recipe in the news print shows 1 tablespoon of garlic powder, we have since adapted this recipe to 1 teaspoon garlic powder, it’s better with less. 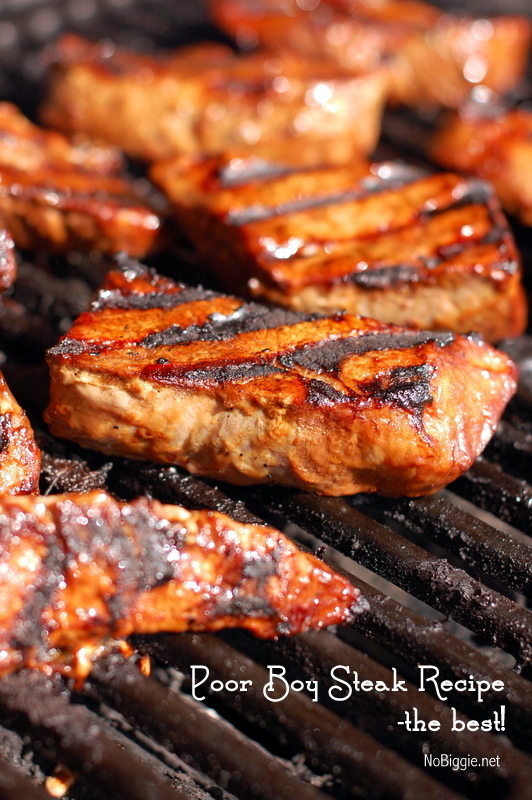 As you grill it, you brush it with more of the flavorful marinade. Take a look at those lovely grill marks. In a medium sized bowl combine the french dressing, ketchup, soy sauce, garlic powder and soy sauce. Mix together until well combined. Place meat in a shallow pan. Pour marinade over meat. Marinate overnight or at least 3 hours. Turn meat over during the marinating time. 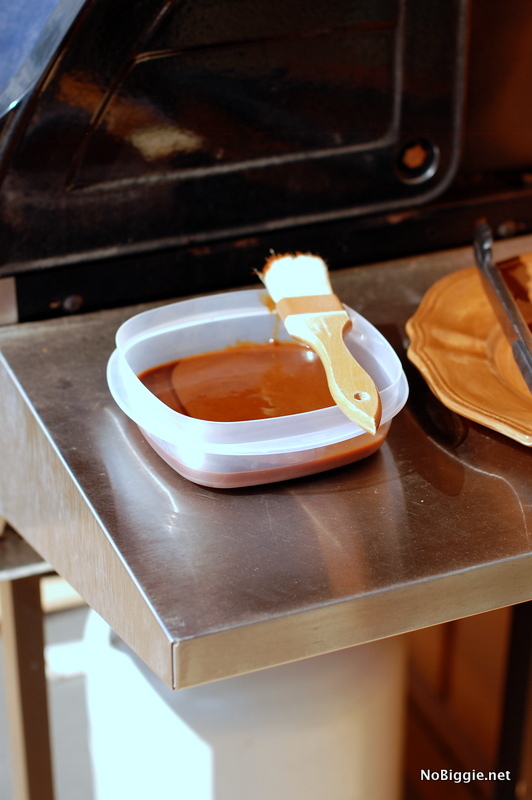 Before grilling remove meat from the marinate brushing off excess sauce. Depending on the thickness (or depending on how you like your meat cooked), here's a good rule of thumb for cooking steaks: Place the steaks on the grill and cook until golden brown and slightly charred, 4 to 5 minutes. Turn the steaks over and continue to grill 3 to 5 minutes for medium-rare (an internal temperature of 135 degrees F), 5 to 7 minutes for medium (140 degrees F) or 8 to 10 minutes for medium-well (150 degrees F). As you cook and turn the steak over, continue to brush the steaks with the sauce every 10 minutes. That’s it! Pretty simple and so good! My grandma uses this marinade on ribs as well. It’s so good. What is meat tenderizer? I remember a package product you could buy. Or is it the mallet to pound meat? I wanna try this recipe. Hi Barbara Ann! I just updated the ingredients. Don’t bother with the meat tenderizer. Do you shop at Costco? If so yay! 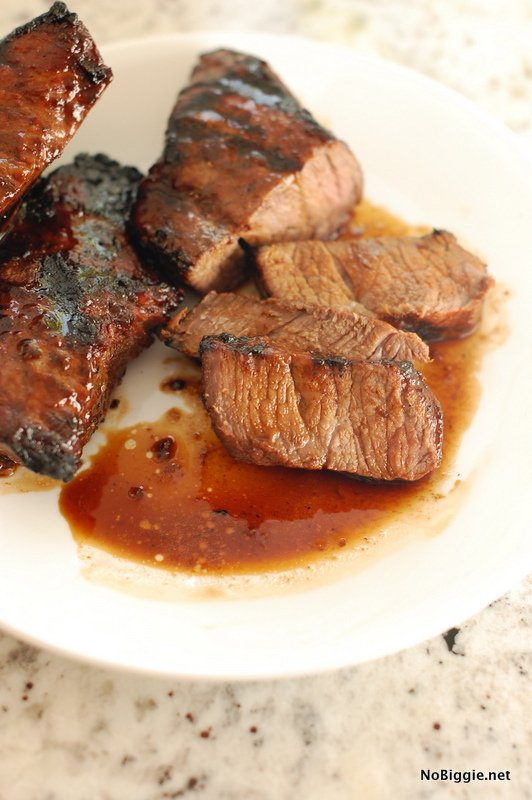 Buy their Tri-Tip steaks for this marinade. Everyone will love it! What temp is the grill at? I’d hate to turn this deliciousness into black charred ash 🙂 Thanks for sharing this recipe! The marinade sounds great and cudos to ur mom, but 1 hour on the grill? I’m scared mine might turn out like marinated boot leather! 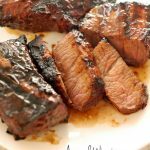 Any advice on using a gas grill for this Awsome Recipe? We do t have Costco in Mississippi! Hi Leanne! You don’t have Costco?! Shoot! Just find good steaks at your local grocer. As for the time, I need to update the time, because originally the one hour time was for a big piece of meat, and now that we’ve adapted it for smaller steaks, it really wouldn’t be that long. It really all depends on how well done you like you steak. I really wouldn’t know what time frame to suggest for temperatures (rare/medium rare/well done). First of all, I LOVE the picture of your mom. Second….yum. Sure! It’s worth a try! The risk is that it will be overcooked, but you could try using your oven’s broiler. yeah, I’d use the broiler if doing inside. Don’t think the George Foreman one would give the same effect. You can cook these on a George Foreman, just won’t get the smokey flavor like you would from an actual grill. I have a small 3 serving Foreman and cook marinated steaks on it with no problems. If you add a cap full of Liquid Smoke, it will have a slight smoky flavor as if you had used a charcoal grill even if you use the George Foreman. I had the same issue when I wanted ribs. I used my Crockpot for that and the Liquid Smoke added just the right amount of “smokiness”. Oh, thanks for that response. I didn’t think the Foreman grill would work but see I was wrong. Oh my goodness! Is your family from Glasgow, Montana? I grew up in Sidney, Montana. Small world! Thanks for the great recipe! Of course it would come from cattle country! Yep! My mom was born and raised in Glasgow! Good recipe. It isn’t unique to you. This was an ‘old family recipe’ for me as well. I have been looking for this recipe for years!! This is the greatest ever!! Thank you!!! What type/brand of French dressing do you use? Hi Cindy! We use Kraft Brand. I’ve had this recipe saved on my Pinterest Board – “Where’s The Beef” for a while now. This evening after a menu change, I whipped this up and marinated some Sirloin steaks for a couple hours. Hubby grilled them on the Gas Grill making sure to baste with the reserved marinade frequently. The exteriors of the steaks finished with Beautiful coloring and the flavor was so yummy. 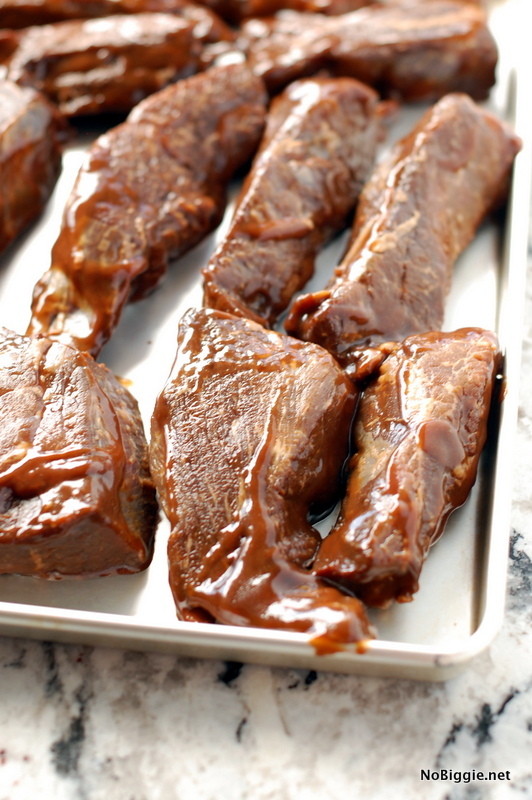 This marinade had a slight sweet and little smoky finish. Only addition we made was to crack some pepper while on the grill. Served with “Heavenly Homemakers” Bacon and Cheese Potato Casserole, Caesar Salad and grilled in the husk Sweet Corn. This definitely makes lesser grades of beef shine and I’ll be using this Marinade regularly! Is this creamy French Dressing. Sorry for a stupid question but I need to be sure.